Don’t get cold feet! The Mauzy Heating, Air & Solar team has the heating solution for your home. Our team has the ability to work on any system—no matter the make or model. By training our team on all types and brands of San Diego heating systems, we’re sure that we can keep your home comfortable year round. If your heater is working well, give it the TLC it deserves with our regular maintenance services that will ensure it continues operating effectively and efficiently. On the other hand, a heating unit that is producing odd noises or smells, fails to maintain consistent temperatures throughout your home, or is contributing to higher than normal utility bills may be in need of repairs. Call Mauzy for accurate, timely service before your home loses its warmth. We also can help you decide whether your heating system is past its prime and due to be replaced. We will make a recommendation for the best installation that fits your needs and your budget, so your home stays comfortable during the cooler months—without burning a hole in your wallet. Need a quote on your heating repair, heating installation, routine maintenance or other heating service in San Diego? Just call today or contact us using our online form. 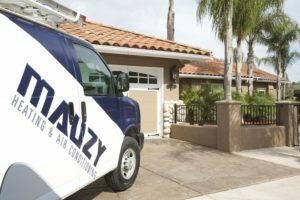 Mauzy offers heater installation, heating system repair and maintenance services on all brands, makes and models of furnaces throughout the San Diego region. By offering a variety of manufacturers, we’re sure that we can keep your costs low and your home warm. Our NATE Certified technicians are trained to be able to fix any heating system from the most simple to the most elaborate. Don’t stress about the cold winter evenings – just give Mauzy a call to book an appointment! Don’t Let Your Heater Let You Down in San Diego! Our team of highly trained heating experts can help you fix any issue your heater might have. From standard tune ups to full repairs or replacements, our heating experts can handle the job to make sure that your home will always stay comfortable! Give us a call today.